​Are We on the Verge of a Big Data Breakthrough? Size matters. And in data, sometimes smaller is better. After decades of trying to decode the mysteries of big data, smart companies are looking to specialized data providers rather than trudging through mounds and mounds of their own data. Finally, those who want meaning from data can take a more contextual, specialized approach. While these metrics might be interesting, the usefulness of this data varies greatly. Ultimately, data is only useful when it helps us track and achieve a goal. In order to make sense of all this data and to start setting goals, we need to introduce a new concept: context. Context is the lens we look through when making decisions. Context tunes out noise and allows us to focus on what matters. Context establishes boundaries, keeping us from wandering off in too many directions. A runner training for a marathon might track miles run, pace, and heart rate. The context is running, the goal is completing the marathon in a specific amount of time, and data helps the runner understand his own progress towards that goal. There are countless other metrics he could track, but in the given context, they won’t be as helpful to achieving his goal. Our runner is looking for specialized data. Today, data-driven companies are realizing economies of specialization. Some focus on health factors, others on television viewing behaviors; still others hone in on retail receipt data. What has evolved from a problem of “not enough” has become “too much”. The best providers are showing companies how data can be useful to them by becoming experts in how to use various types of data to solve specific business problems. Simply put, data is no longer about mere accumulation. Companies require context and an answer to, “So what?” The desire for more data is being supplanted by a desire for more useful data. If big data really is on the verge of a breakthrough—and I think it is—it is because data providers are starting to produce more specialized data sets. So, if you want to make the most of the next big thing in data, remember to think small. 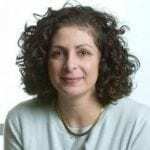 Anita Absey, General Manager of Consumer Insight, joined Return Path in 2003 with extensive experience helping marketers create profitable and engaging email programs. Anita has held several executive positions at Return Path, leading both the Global Sales and Global Services teams during her tenure. She now leads the Consumer Insight business where she focuses on using the power of consumer preferences and buying data to help marketers and brands make informed decisions about engaging with customers. A veteran of the database and digital marketing industry and a self-proclaimed “data junkie,” she helps some of the world’s smartest marketers successfully integrate data and technology into their customer acquisition and customer relationship management programs. She is an active member of the Direct Marketing Association, having served as the Chair of the Ethics Operating Committee and as co-Chair of the Email Experience Council. Prior to Return Path Anita spent much of her career at Acxiom and Abacus Direct (acquired by Doubleclick). She holds a BA in Economics from Fordham University.